Upon returning to Cancun from Chicago it suddenly feels very hot, even though it’s only about 88 or so. One last night in the Marriott Courtyard then back down the Yucatan peninsula to Belize. On the Facebook Pan Am Travelers group I see that somebody is looking for someone to pick up a package of motorcycle parts at the post office in Tulum and meet up somewhere in Guatemala next month. Since I’m on the way I volunteer for courier duty. Next day I drive down to Tulum and find the tiny post office. It’s about the size of a one car garage with two guys behind a counter and packages piled up to the ceiling behind them. I give them the tracking info and after about 5 minutes or so they come up with the package. They ask for my ID, which has nothing to do with the name on the package. After writing down all of my Florida drivers license details they hand over the package and I’m on my way. I opened it just to check that it was really a head and piston and not packed full of meth or something like that, since I will be carrying it across two borders. Off to the ruins at Tulum (site of Bachelor in Paradise I am told) which are much smaller than others I have visited, but the location is beautiful up on cliffs over the Caribbean. The ruins are covered in iguanas soaking up the sun. There are actually more people on the beach than touring the ruins. Since I already paid $150 pesos to park at the ruins I decided to just camp in the parking lot there, after checking with the parking boss. The ruins close fairly early so it is pretty much emptied out by sundown. Lots of restaurants and gift shops at the entrance. I have some Marriott points to use so I booked 3 days at the Cancun airport Marriott Courtyard, 2 days before flying to Chicago and 1 day on the way back. If you stay there they provide parking in their secure lot for a reasonable fee, so I can leave the Land Cruiser behind in Mexico with no worries. 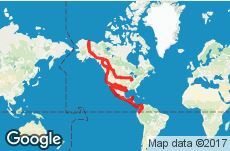 The amount of resorts along the way is amazing, pretty much from Tulum up to Cancun is one beach resort after another. Cancun itself is very modern, almost like an American suburb. I go out to the local mall to pick up some snacks and eat dinner and it’s full of parents in BMWs and Mercedes dropping their kids off to hang out. When I make it down to the Blue Line station I’m quite excited to see not one but two Christmas trains in the station. Mrs Claus and an elf welcome me back to Chicago. It’s great to spend time with family and friends but holy cow is it cold. These past months traveling the southwest and Mexico have really thinned my blood. It doesn’t help that a couple of days after the big snow storm the temperature drops to -6. The time passes all too quickly and before I know it I’m back on a plane to Mexico. I’m flying to Chicago for a visit before Christmas, leaving the Land Cruiser parked in Cancun for 10 days. I have seen a couple of mentions that Mexico has just recently linked their customs info with their immigration system and that it could be a problem leaving the country, even temporarily, with a vehicle imported under my passport number. Since Quintana Roo is a vehicle free state like Baja (no temporary import permit required) I decide to stop by the Mexico-Belize border outside Chetumal and cancel the TIP before heading up the peninsula to Cancun. It takes a minute to convince the lady at the immigration booth that I don’t actually want to leave Mexico, just go past her booth to the banjercito to cancel the permit then turn back into Mexico. No problem cancelling the permit, but they are very thorough. The banjercito lady comes out and takes several pictures of the Land Cruiser, 2 different pictures of VINs, picture and scan of the windshield sticker, then pulls off the sticker. I should get my $300 deposit refunded to my credit card in a few days. Then back through customs for a brief search. Even though I have only gone about 100 yards past the customs station they still want to check everything. A couple hours north of Chetumal is the beach town of Mahahual. It used to be just a little fishing village until they put in a cruise ship port north of town, so now it’s more developed and full of tourists on ship days. I arrived on a Sunday with no ships so it was pretty quiet. There is a huge sidewalk running the length of the beach with hotels, bars, restaurants and shops on one side, beach on the other. It’s a little hot but not bad with the beach, plenty of shade from palm trees and palapas. The water is perfect for swimming, clear and warm with lots of coral reefs right offshore. I jump in with my WalMart snorkel gear and see tons of fish, coral, and a decent sized octopus. Next day around 10:30 taxis start pulling up and dropping off cruise ship tourists for the day. It’s a little crowded around lunch time but they all clear out by 3 or 4. I had intended to make my way up to Cancun over 5 days but it’s so relaxing here on the beach I end up staying in Mahahual for 5 days. The ruins of Calakmul are in the state of Campeche just 35km from the Guatemala border. It’s a huge site with over 6,000 structures, but has not been excavated and restored like Palenque. It’s about 60km off the main highway on a twisty and sometimes rough road, so I don’t make it to the ruins until later in the afternoon. The bright sun and jungle shadows make it difficult to get good pictures. Calakmul is known for its many inscribed stelae. They are made of limestone and have mostly eroded away over the years. These are supposed to be monuments to the many kings and their wives. The jungle has not been cleared back much, which lends to the Indiana Jones/explorer feeling of the ruins. Everywhere there are trees growing out of and around the ruins. One of the stelae with part of the inscription remaining. I have a couple of hours to wander around in the ruins. This late in the day it is very quiet, just a few other tourists here. It’s out in the middle of nowhere with only one resort right at the highway, but although they did have a room available it was $200USD. On the way back to the highway I can drive a little faster as there is no oncoming traffic. I have to dodge several groups of peacocks crossing the road and at one point I saw a huge tarantula highlighted by the sun in the road ahead. I checked in the rear view mirror and I’m pretty sure I squashed it. It’s getting dark when I reach the highway and the nearest town with a hotel is 35 miles away, so I decide to break the #1 rule of driving in Mexico: Never drive at night. This highway is the straightest, smoothest road I have been on so with topes (speedbumps) few and far between so it is not too risky. Arriving at the unexpectedly nice hotel I check in, crank up the AC, and enjoy a much needed shower. As today is my birthday I went to the hotel restaurant and splurged on a steak dinner with a couple of cold Coronas. I have seen many warnings about blockades and robbery on the highway from San Cristobal de las Casas to Palenque, particularly in the town of Ocosingo, so I decide to take the detour to the north almost to Villahermosa then east to Palenque. It’s several hours of more serpentine mountain roads then the highway descends toward sea level nearing Villahermosa. When I get onto highway 186 heading east to Palenque it’s straight and flat through endless miles of banana plantations. Usually this is kind of boring but after all these months driving through the Mexican mountains it’s a pleasure to just cruise along. It turns out I made the right decision, I later read on the Pan Am Travelers Facebook Group about another couple who left San Cristobal on the same day (Dec 1) and were stopped at a roadblock in Ocosingo and had to backtrack and take the detour anyway. I made it to Palenque mid afternoon and got a little cabana at a small resort right at the park gate. It’s just a little screened in room with a bed, one light bulb and one outlet but very cozy, it looks like a place Survivor contestants stay when they win a challenge. There’s a good pool just outside which is very refreshing after a long day’s drive, and a nice restaurant across the road. It’s surrounded by jungle and at night I can hear howler monkeys moving through the trees. In the morning I go to the ruins. It’s a bit of a hike past the parking lot but very cool to walk out of the jungle and see the ruins looming out of the mist. Since I stayed right at the park entrance I am there before all of the tourist crowds. Early in the morning it is very cloudy, looks dramatic. I almost sat on this iguana, it blends in with the rocks so well. It’s very impressive, but they have done a lot of restoration and reconstruction. The main tourist site is maybe one square mile, but there are thousands of buried buildings and temples around it. This is what an un-excavated building looks like, just a hill with some stones sticking out. After three days relaxing in Santa Maria del Tule it’s time to hit the road. It’s about 900 KM to San Cristobal de las Casas over mostly twisty mountain roads. No more blockades, thankfully. The scenery is great, arid mountains covered with cactus. A short video of mountain driving through Oaxaca. For some reason my dashcam has a high pitched whine so I usually edit out the sound. I added the song that was playing at the time back in for extra ambience. It takes me two days to make it to San Cristobal. On the way I stayed at a little no frills hotel in Zapatepec . I pre-booked a hotel in San Cristobal since it seems to be packed with gringos on vacation. It;s the last of the old colonial cities on my Mexico tour. The only downside is that the “free parking” they promised on hotels.com is street parking. Which nobody does in Mexico. The lady at the hotel desk assures me it is safe to park on the street overnight so I give it a shot. Coming back late to the hotel on the first night I am the only car still parked on the street, but nobody messes with it so I guess it’s OK for another night. San Cristobal is a another great walking city; the center is pedestrian only so there are lots of interesting restaurants and shops along the streets. It has a large tree lined square in the center with many benches to sit and watch the city go by. There are many gringo restaurants on the pedestrian streets but I found a traditional Mexican pizza place a couple blocks outside. I’m not sure if it is a holiday or just the usual Mexican fireworks but they have gigantic fireworks going off all day and night. During the night there is a group marching around with a band and apparently unlimited fireworks. They’re marching along with trumpets, tuba, and drums then every half block or so they stop and light off a huge firecracker. The entire night. Makes it hard to sleep, and on the second morning around 5:30 I give up on sleep and head off toward Palenque.